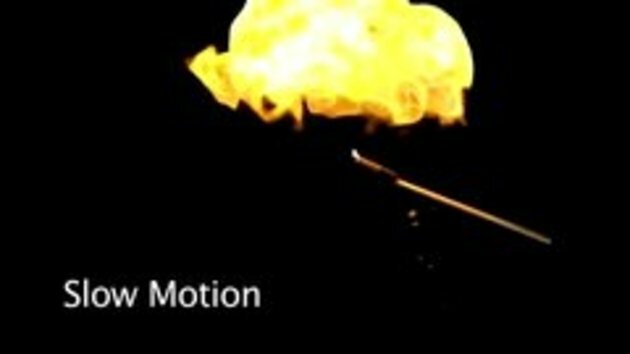 Theo Gray fills soap bubbles with a hydrogen-oxygen mixture and lights them on fire. I thought that H + 02 = Water. How the heck are they able to make the H to bond exactly with one O. #2 It's not H20 it could well be HO or something like 2HO. Just think of the hydrogen bomb. It is hydrogen and oxygen being lit on fire, basically. It's just the oxygen concentration there is much higher and it is much less dense. The bigger one at the end was the best. oxygen doesn't mean 1 atom of oxygen, hydrogen doesn't mean 1 atom of hydrogen, it is instead an unset volume of each gas. So when you mix hydrogen with oxygen you are not mixing 1 hydrogen atom with 1 oxygen atom, you are instead mixing a lot of both together. But to answer your question, it is based on equilibrium. H2O is more stable then OH and consequently the reaction will proceed towards H2O as the OH will bind another hydrogen but at any one stage there is some lonely oxygen, some lonely hydrogen, some OH and some H2O and transition states in between. a hydrogen bomb is most certainly not hydrogen being oxidised by oxygen. a hydrogen bomb relies on fission to release a lot of energy that will then compress hydrogen so much so that it fuses (fusion) and releases an even larger amount of energy. #3 better start hitting yr head on a wall ffs with yr personal thinkin science dumbass. hydrogen bombs work principally through fusion while nuclear bombs work through fission. @ #6 and i like fishin' is that the same?